Question: How many cats figurines can one person have to decorate a house. Answer: As many as they want! For yesterday’s photo of the day, I took a photograph of one of my favorite kitty items – – some “rock cats” — i.e. 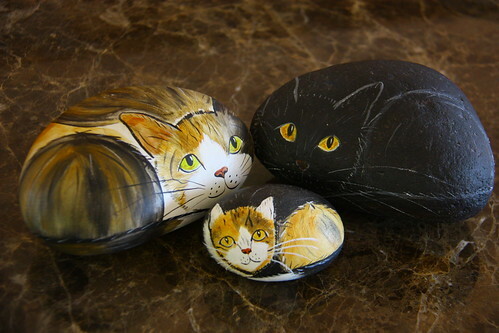 — cats painted on river rocks. I found these in a shop here in Hilton Head, and then more of them in a shop on River Street in Savannah. Each and every time I visited these stores, I *had* to purchase at least one — first for me, and then for my friend, Claire, who ended up loving them as much as I did. In fact, she puts one of the smaller rock kitties into her manger scene. I even put one in Ray’s Christmas stocking one year! They weren’t horribly expensive – the little ones going for only (about) $10., and the larger, more intricately painted ones for maybe $35. or $40. Each and every one has the words “Lats Cats” painted on the bottom of the rock kitty. I finally asked one of the shop keepers who the artist was. According to her, she was from some place in New York state (I can’t remember where at this point), and she collected the rocks from rivers in that area. However, she also had a home on Hilton Head Island, which is why they were being sold in this area. After the rush of holidays in the fall, beginning with Labor Day and ending with Christmas, there is a “dry spell” during the months of January – March until we get to Easter. Or … that’s how it feels to me. In the beginning of January, I’m relieved to have the holidays in the past, so I can get back to normal. Yet – – as the cold of January and February encase us, we long for something new, bright, celebratory and full of emotion. 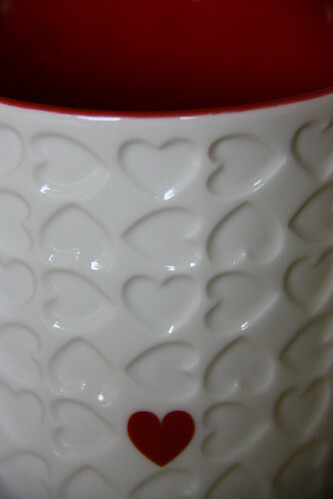 The “defacto” holiday, “Super Bowl Sunday” fills some of those needs, but Valentine’s Day fulfills them all. We celebrate “romance” and all those wonderful emotions. The color “red” – the color of our “heart” – of “blood” – which pumps wildly when we are madly in love – is the symbol of the day. We wear red clothing. The roses that we give to each other are red. Red is a warm color – in sharp contrast to the white snow on the ground and the lack of floral color. To immerse oneself in “red” and it’s warmth, and what it symbolizes feels mighty good! The difficulty – at least for me – comes with the reality that romance requires something of us. I’m not referring to the physical act of purchasing gifts for a loved one, or other material representations of romance. Bottom line – it’s about the attitude of romance … of love … of “giving” and what is required of us to be in that emotional place. “Romance” and “love” are not nouns. They are verbs … “action words”. It’s not a state of being. It’s a state of action … of movement. I guess if the truth be known, I struggle with this, and I personally think others do as well. Valentine’s Day invokes feelings in me of inadequacy and guilt that I’m just not quite good enough in that department. I know that I don’t have the vulnerability of spirit that I believe is important to being a person who loves well. I suspect I don’t show love to others easily because I don’t feel worthy of the love I receive. I encase my heart with my fear. I don’t let it in because I don’t feel lovable, despite the fact that I know intellectually I’m loved by the special people in my life. Also – when growing up, our family was not the demonstrative kind, and overtures of affection were not often modeled. We all knew we loved each other, but didn’t overtly show it to each other. On Valentine’s Day, sometimes I wish for the day to simply “end”. I don’t want to think about all of this, but the day, by it’s very existence, reminds me of my shortcomings. It has also occurred to me that besides being a convenient distraction from the desolateness of “winter”, why is it that we “need” a “Valentine’s Day” to show our love to the special people in our lives? Shouldn’t EVERY day be Valentine’s Day? Maybe it’s because we don’t routinely show our love and we need the excuse of a day in order to do so? Maybe institutionalizing “love”, as we have done on Valentine’s Day, gives us permission to show it in a way that privately giving ourselves permission to “show love” does not. I suspect I’m not the only one who struggles with showing love. I also know that it causes distress and sadness for people who do not have a “significant other”, or who have just lost one to either death or divorce. I remember the year 2001 when Ray and I were going through hard times in our marriage. He was threatening divorce, and we were, for all practical purposes, separated. (Thankfully we got back together! ). Valentine’s Day that year was morose – reminding me of the dire circumstances of my life at that point. So – I can relate to how others feel on this day. The truth is that love is not only about our significant others, and my “Valentines” include my son, my mom, my special friends. It’s not just about romantic love. Wouldn’t it be nice if we focused just as much on those other loves in our lives? I didn’t do enough for Ray this year on Valentine’s Day. I didn’t even get a card for him! I feel lousy and don’t know why I didn’t do it. I love him. What was the big deal about getting a card?? I reminded myself on Saturday – – then again on Sunday – – then again yesterday, the morning of Valentine’s Day itself. I didn’t do it each time I thought about it. I felt even more guilty when he came through with not one, but two cards – one from our cats, and one from him. Ray and I usually just go out for dinner for Valentine’s Day to a nice restaurant, and we did so on Friday night to avoid the Valentine’s Day madhouse in the restaurants. It’s easy for us to choose the place, as we both favor Italian food, and our dinner together at Michael Anthony’s was superb. We do not always give gifts to each other to honor the day, and neither of us did anything this year. There have been a few years where we have – – but most times not. And, sadly – Ray has been much better about it than I have been. Again – why do I resist? I love Ray – very much. He’s my world. He’s my rock. But, I suspect it’s this attitude of love – and romance, and the ability to SAY and SHOW that to him – that is lacking in me.